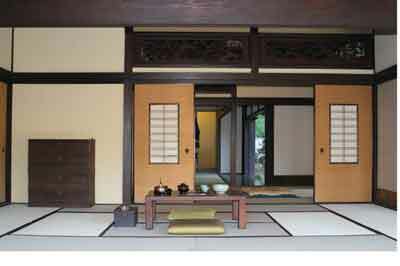 Traditional Japanese woodworking was carried out by a local shokunin or mastercraftsman. The tools that he used would have been forged by a blacksmith. Because of the cultural importance of the swordsmith the making of edged tools was a very high-status occupation. 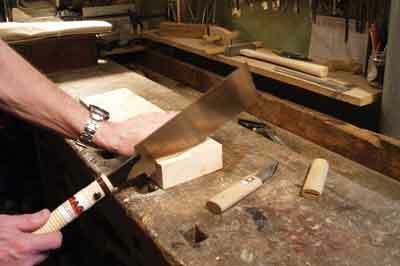 When the wearing of swords was prohibited, many swordsmiths turned to making edged tools. Because the smiths were treated with great respect the items that they made, planes, chisels etc, were also treated with respect. Today some smiths have the status Ningen Kokuh, which translates as Living National Treasure. 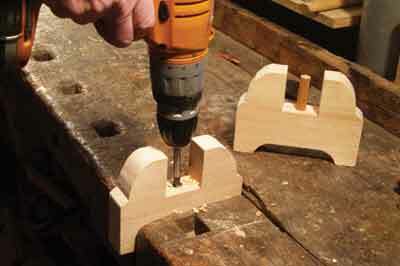 Shrine carpentry has also contributed to the maintenance of a tradition of respect. Traditional Shinto and Buddhist shrines are built of timber. Some of these shrines date back to, in our terms, pre-Norman Conquest construction. 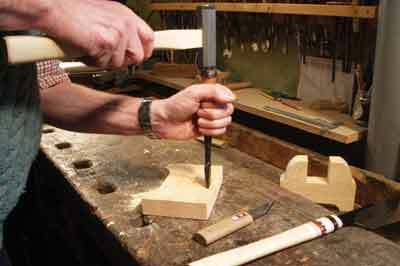 Their maintenance is perceived as a social and religious duty and the carpenters who perform this maintenance do so with a religious attitude that percolates through to the tools and techniques that they use. Because of these two almost unique cultural approaches a strong defined tradition of woodworking has emerged. 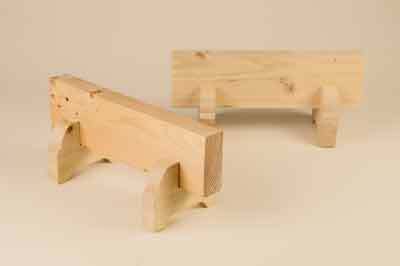 The pullsaw has now become an accepted item in western woodworking and is it interesting to conjecture how they originated. 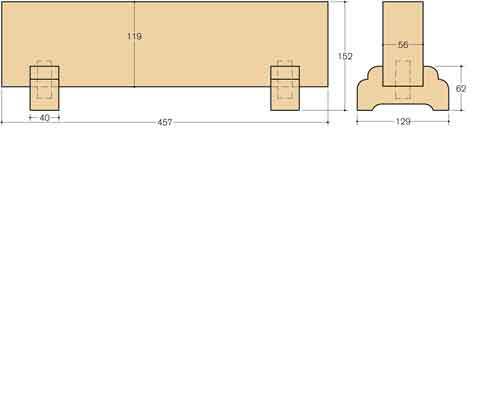 One theory is that because Japanese carpenters sat on the floor to work they could not exert enough forward pressure on a saw that cuts on the push and pull stroke so they filed the teeth to cut on the pull stroke only. Because there was no longer a need to push the saw through the work the saw blade could be made thinner. 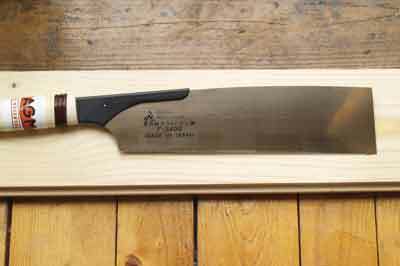 The thin blade was always in tension when in use for cutting so the kerf did not wander and the result was a thinner, straighter cut. Early sawyers realised the need to have specialist saws for each type of work and timber, instituting the filing of teeth for cross- or rip-cutting. In case you are wondering what softwoods are used, the better quality softwood timbers for Japanese work are sugi cedar and hinoki cypress. 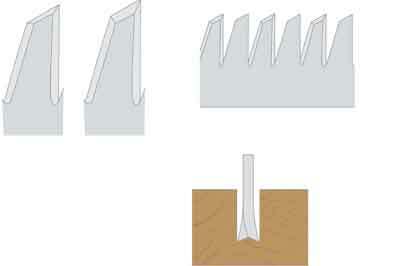 The ripsaw for hardwood has a greater gullet angle than the ripsaw for softwood which has a more acute point to the teeth, but otherwise the chisel-cut teeth are similar to western saws. 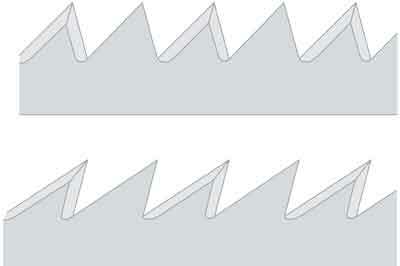 The crosscut saw for hardwood has a less acute bevel angle. Japanese saws are not graded according to teeth per inch tpi. Instead teeth are sized and graded for each blade length. Ripsaws have small teeth by the heel of the saw and large teeth at the toe. 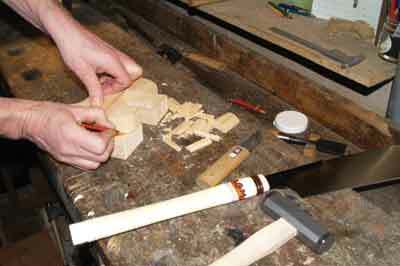 The cut is started with the teeth at the heel and once established is moved up the saw to the larger teeth. 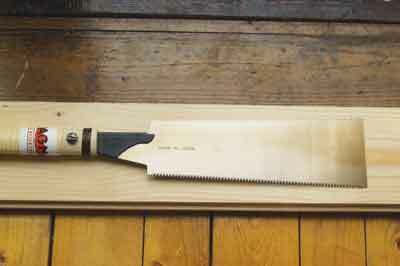 The most useful is the ryoba, a double-edged saw with rip teeth on one side and crosscut teeth on the other. It is sometimes difficult to start a ripsaw cut, but a ryoba allows you to define the start of the cut with the crosscut teeth and then turn the saw over and continue with the rip teeth. The fact that this saw has both types of teeth means that if push comes to shove you can cut all joints with this one saw. 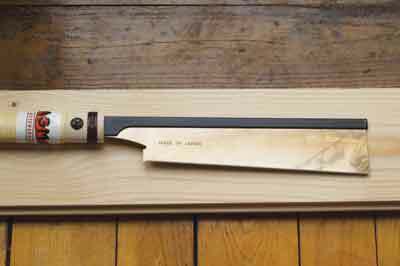 The next most useful saw is the dozuki, a word which actually means tenon. The dozuki is used to cut very accurate shoulder lines. Its teeth are very small and it is useful to have a longer crosscut saw without a back. 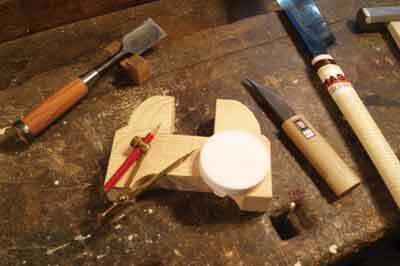 The dozuki will only cut to the depth of the blade below the back, so my backless crosscut is a kataba. 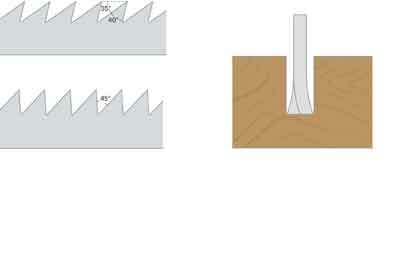 Some joints require angled cutting that is not at 90 degrees to the grain line. For this a saw with ibara-me or nezumi-ba teeth is used. These teeth are part cross and part rip and give a very fast cut. There are also some very useful keyhole saws, flush-cutting saws and convex saws for starting cuts in the middle of a panel. All these saws will produce a very smooth cut that requires almost no easing or shooting. The blades are replaceable but not re-sharpenable. Sharpenable saws are available but I have not seen one in the UK yet. It is hard to say how long a blade will last but I generally expect to get about six months from mine. A replacement blade generally costs about Â£20. The Japanese woodworker sits on the floor and uses sawhorses to raise the timber off the ground in order to give clearance for the saw. 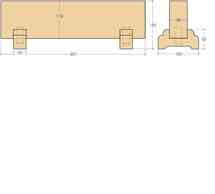 Even if you do not sit on the ground, a pair of benchtop sawhorses like these is very useful. Using these sawhorses to raise the work up protects my bad back and also means that I am closer to the scribe lines and therefore able to follow them better. The texture of wood is an important part of Japanese aesthetics. The Japanese response to wood comes from their approach to the natural world. Plants, animals and the countryside are valued. The art is in making the prepared timber appear natural and organic. The shokunin was taught to believe that he had a disciplined relationship with the community in which he lived and worked and that he had an aesthetic relationship with his materials and finished products. 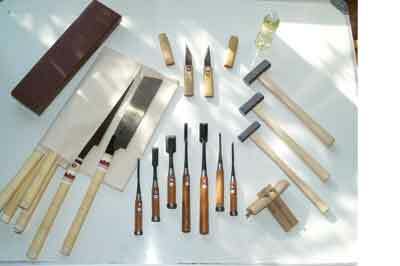 In Japanese Woodworking Tools, Their Tradition, Spirit and Use, ISBN 978-0-941936-46-0, Toshio Odate. Odate says shokunin means not only having technical skill, but also implies an attitude and social consciousness. Note that the title includes the word spirit. This is what is unique about the Japanese approach. The craftsman seeks to relate to the spirit of the craft. Respect also incorporates a sense of balance and harmony. Traditional designs are intended to demonstrate balance. That means an object or a design feature, such as decoration, is worthy in its own right. An extreme example of this is the fact that a collector of pots may have dozens of different pots but will only show one at a time. In order to fully appreciate that pot, it needs not to have the distraction of other pots around it. Compare that idea to the European idea of trying to put as many pots on a display shelf as you can fit. This is one reason why pictures of Japanese interiors look so calm and restful. The design is complete in itself. It is neither too high, too long, too wide nor too busy. It is resolved. If the eye is led anywhere it is led where the designer wants. In Japan the function of an object is not hidden under masses of ornament. A Japanese child is brought up with a sense of balance within the house and the world they experience. Major festivals emphasise the appreciation of natural beauty, such as the cherry flower festival or the marriage of two naturally occurring rocks that look as though they should be joined together. Inner meaning and animism allow every object to have value. In one sense this is kitsch, but for serious objects Japanese culture acknowledges and responds to their spirit and beauty.